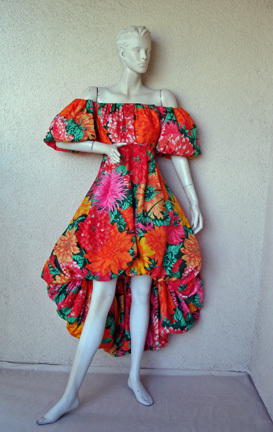 Scaasi dress with full pouf skirt fashioned in an elaborate floral print silk combination; a style typical of the excess manifested in fashion of the 1980's. 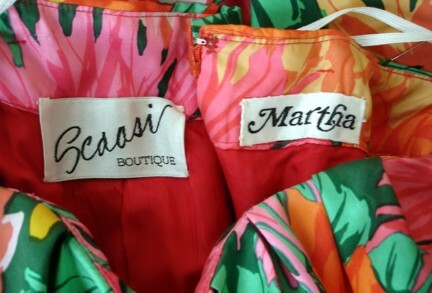 Dress is documented in Scaasi's book, "A Cut Above", page 152. Beginning his career as an assistant to legendary American fashion designer, Charles James, there is no doubt that Scassi's inspirations of elaborate, bold and dramatic creations derived from his beginning years as an apprentice to James. 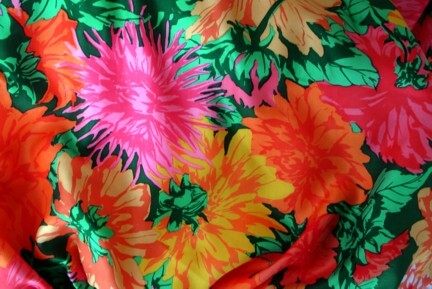 Dress is fashioned of an exuberant floral silk print in rich bright shades of orange, peach, winter green, with splashes of gold and yellows. Pouf sleeves with lightly elastizied neckline creating a complimentary bare shoulder look. Bodice is lightly boned. Skirt is lined in stiff horse hair crinoline for fullness. Back zipper closure. 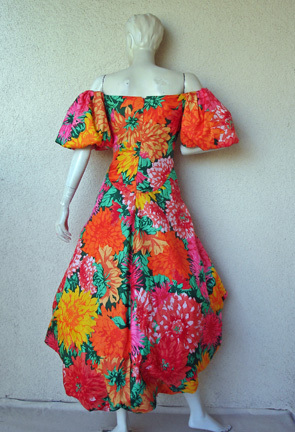 Size: 10; bust: to 36": waist: 30"; front length: 26.5": back length: 47"
Label: Scaasi and Martha's (very prominent boutique in NYC and Palm Beach, Florida).